Yesterday I told you about how I am not always good at living in the moment. Helping my daughter get ready to return to college was no exception. In addition to helping my daughter pack, I had some rather ambitious ideas of things I wanted to bake during her last week at home. My daughter had mentioned a couple of desserts she would enjoy; Hershey Pie and Apple Crisp. Additionally, I wanted to make some cookies for my son's lunches - and I thought it would be nice to bake something for my daughter's new roommates. At first this all seemed feasible, but as the departure date approached, I became busy with other tasks. Also, I wanted to focus on enjoying the limited time left with my daughter, while she was still home. If you have been reading my blog this week, you will know that I did manage to make a Chocolate Marshmallow Pie, and shared the recipe last Thursday. I baked a big batch of Chocolate Chip Pan cookies - some of which I set aside for my son, and the rest I wrapped up for my daughter to take with her. But, it felt like I would be really rushed if I took the time to make an apple crisp. Suddenly - I thought of an easy option, which would enable me to complete my goals without becoming too stressed. 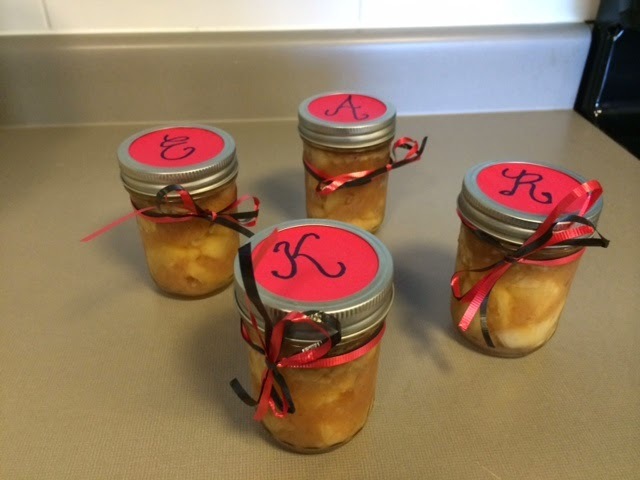 I could make cute little jars of apple crisp as gifts, for my daughter and her roommates! About a week before, I had come across a recipe for Mason Jar Apple Crisp on the blog New House New Home New Life. 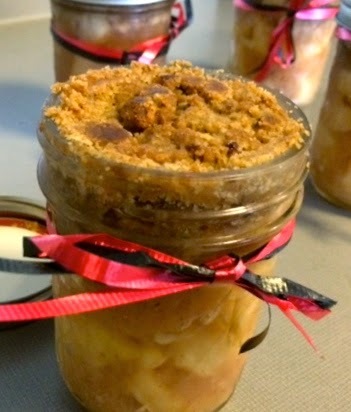 The recipe suggested that individual servings of apple crisp could be assembled, baked, and served in small, wide-mouthed mason jars. I did not have wide-mouthed jars, but I decided my 8-oz jelly jars would work. 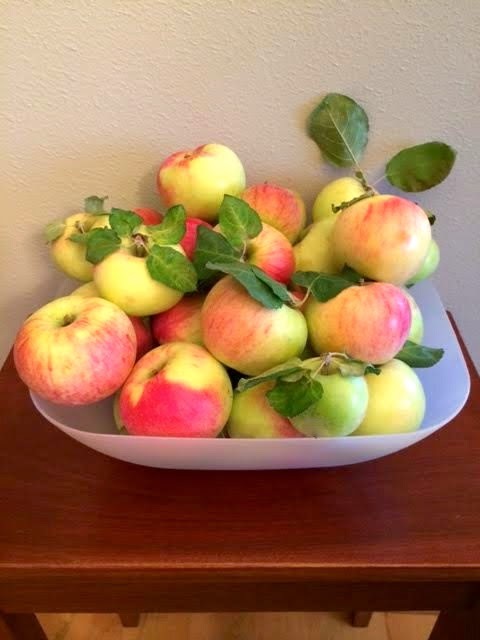 Last fall, neighbors had kindly given me a bunch of apples from their trees. Using them, I had prepared a number of containers of cooked, sweetened apple filling; which I froze to be later used for pies or crisps. There were still two of these containers left in my freezer - just enough to fill four-to-six small mason jars! Perfect! We received this huge batch of apples from my generous neighbor just this week. I will let you know what I do with them this year! I quickly made up the topping for my apple crisps, as suggested in the recipe. (I only made half the amount, as I planned to fill only half as many jars as suggested in the recipe.) I put this crumbly mixture into a sealed plastic bag, and then I decorated my jars. Using the metal insert piece from a jar lid as a template, I cut circles of construction paper. In my best handwriting, I wrote the first initial from each girl’s name on each one, and then fit the paper circles between the metal insert and the screw ring for the lid. Then I cut lengths of ribbon, long enough to tie around each jar. Just before we left home, I popped the containers of frozen apple filling and the bag of topping for the crisps into a cooler. When we unpacked our car at my daughters college ten hours later, the topping was still cool, and the apple filling was only partially unthawed. Once the filling had thawed, in my daughter's new kitchen I spooned equal amounts of it into the jars, leaving enough room to place a generous amount of the butter-crumb mixture on top. It was important to keep the contents below the level of the jar, so the lid still fit after it was baked. After tasting these, I bet the girls won't mind that I was the first person to use the oven in their new kitchen! To make these cute little apple crisps, either use your own recipes for filling and topping - or use the ones in the Mason Jar Apple Crisp link provided above. I had more filling and topping than would fit in four jars, so I baked the remainder in a small pie pan. I sampled this, and it was delicious! The only thing I would do differently would be to use wide-mouthed short mason jars, instead of the narrow jelly jars that I had, as the crisp topping would be spread out over more surface area. 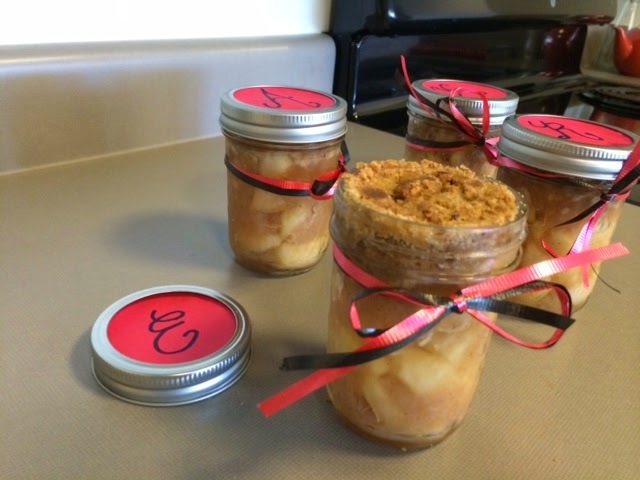 These apple crisp jars are a cute gift, even if the ribbons were rather hastily tied! Such a quick and easy project! Now all that had to be done, was for my daughter to wait for her roommates to arrive, and to buy some vanilla ice cream! Have you ever baked a dessert in a mason jar? Midlife Boulevard set up a Blog Hop where bloggers can submit their best post from 2014. It is impossible for me to pick a favorite, but I think most people like Apple Crisp, so I chose this one! Be sure to check out the other great links! What a great idea - love how you cooked the crisp right in the jars! This was a very thoughtful gift - and I'm sure the girls were thrilled to have something home baked! What a great idea! I've never put a mason jar in the oven before. I would have added water too! I'm not sure the water made much difference - the original recipe I linked didn't call for that step. I was particularly leary though, as I had never used that oven before! Thanks! I was quite pleased with how they turned out. Thank you Katherine!! And thanks for hosting such a great blog hop! That looks delicious - and a memory for your daughter and her friends to hug to themselves. I hope so. And hopefully just the first of many great memories they create this year. What a fantastic idea and I'm sure the girls loved it. Thanks Delores - I think they did! Okay - now I want one! And that bowl of apples is really a beautiful Fall decoration. Pinning! The other nice thing about the bowl of apples, is it adds a wonderful fragrance to the room! I'm going to do something with them soon though. Glad you liked the post Ronda!